We manage a team of professionals, MBA’s, CPA’s, and business certified practitioners. Our years of experience in managing multiple business functions are what makes us Subject Matter Experts (SME) at meeting your company’s needs. In 1991, Phil formed ACUMEN Corporation after serving as a Partner and Vice President, Marketing for a large mid-Atlantic computer services company. After starting his information systems career with Norfolk Southern Railway, he served in various technical and management capacities with several firms including the large conglomerate, Continental Group of Stamford, Connecticut. Go Bobcats! An alumnus of Ohio University, and adjunct Professor with the University of Richmond Management Center, he was a founding member of the Business Advisory Board for the Institute for Enterprise-Wide Solutions at Virginia Commonwealth University. Phil speaks at conferences and symposiums on business development and the focused deployment of information systems.. He has been an active contributor and served on the Central Virginia board of APICS – The Educational Society for Resource Management. Phil has also organized and led several national business partner councils for product developers in order to provide both developers and clients with current and success oriented strategies to stimulate growth in the Enterprise Resource Planning environments. He is a community leader, has presided over several homeowner and charitable associations, and is frequently quoted in the business media. Co-founder, Sandra came to ACUMEN from public accounting. Previously, as an executive for the international holding company of the Independent Grocers Alliance, Sandra managed logistic performance centers, and inventory-related audits. During the prime growth period of one of the nation’s largest catalogue showroom retailers she managed sales-related audits on a national scale. She sat on various systems deployment advisory councils for the firm including the Security department’s Information Systems Strategic Steering Committee. In several executive positions Sandra has worked with inventory optimization helping companies begin their growth strategies for technology. An alumnus of OU and Virginia Commonwealth University, Sandra has a strong financial background, and is an accomplished graphic designer and marketing pro. As the editor of an award winning APICS newsletter, she received the prestigious award in the “Fit To Print” category of journalism. Sandra is also a member of the Gold Key Honor Society. As a community leader, she served as President of Central Virginia’s Educational Society for Resource Management (APICS) chapter for several years. 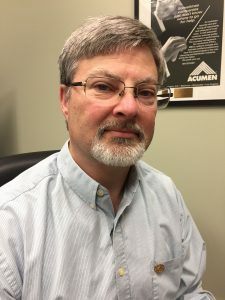 Mark Ownby originally joined ACUMEN Corporation in 1994 shortly after achieving his degree in Mathematics and Scientific computing from the University of Virginia. In his current role Mark works with clients overseeing the implementation of SAP Business One having many years of practical experience and appropriate certifications. He also has responsibility for the OpenAccounts practice all over North America. His numerous project successes allow him to offer advice on business processes as well as information technology. That valuable combination is firmly based upon best practices insight gained from industry leaders all around North America. He has managed projects from Canada to Mexico and all over the United States. Prior to being promoted to Vice President his assignments with the company included managing consultant and manager of the programming department. Chip’s background uniquely applies to the ACUMEN business model. Prior to joining the company he served as Director of Sales for CodeBlue Technology, a Richmond, Virginia based IT services and cloud application hosting company. Prior to CodeBlue, Chip Served as Vice President of Sales and Customer Care at Velocity Micro, a premiere boutique builder of custom, high performance PCs and workstations. While at Velocity, Chip led a team who selected ACUMEN Corporation and SAP Business One to meet their end-to-end Enterprise Resource Planning needs. He was heavily involved in the implementation of SAP and has become a product expert.